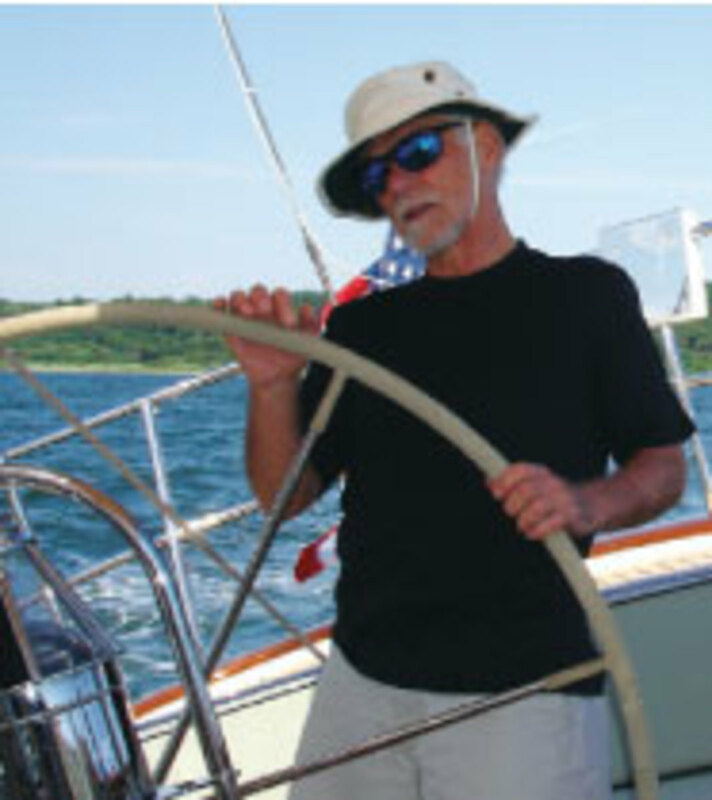 Istvan Kopar has a lifetime of sailing and marine industry experience. Conrad Colman said this after he completed the 2016-17 Vendée Globe under jury rig. The winner had crossed the finish line 74 days after starting; Colman finished in 110 days. Preparation to avoid that fate is what’s happening now for the 2018 Golden Globe Race, the re-creation of a solo, nonstop race staged in 1968. The Sunday Times Golden Globe Race awarded a trophy to the first person to complete a solo circumnavigation via the five capes and a cash prize for the fastest time. 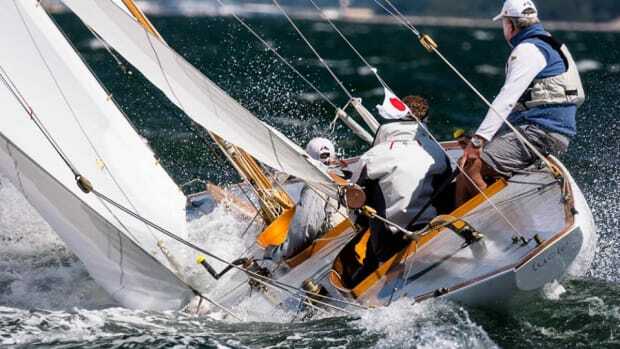 Sir Robin Knox-Johnston, aboard a 32-foot wooden ketch christened Suhaili, was the only one of nine sailors to finish. 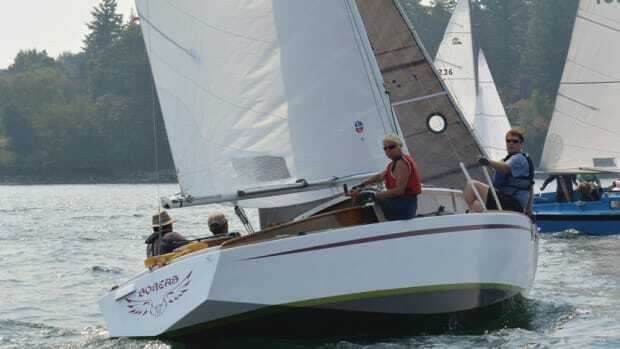 Although the original race had virtually no rules, for this running — scheduled to start July 1 — boats have to be fiberglass, designed prior to 1988 and built in a series of at least 20 yachts from one mold. 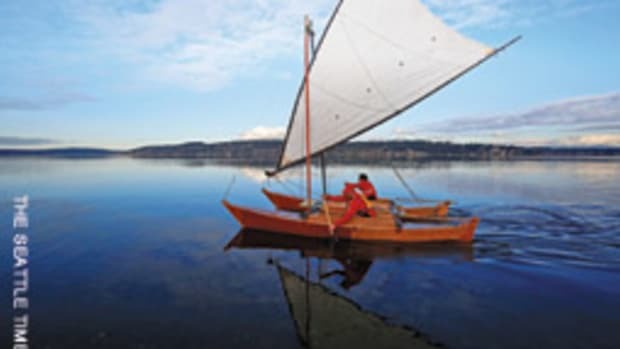 The LOA has to be 32 to 36 feet (excluding bowsprits, wind vanes, outboard rudders, boomkins and pulpits), and the boats must have a full keel with the rudder attached to the trailing edge. A minimum design displacement of 13,668 pounds also is required. Istvan Kopar is one of 23 provisional entrants in this new Golden Globe Race. Originally from Hungary and living in Boca Raton, Florida, Kopar is one of three American entrants and, at 62, the fourth oldest. 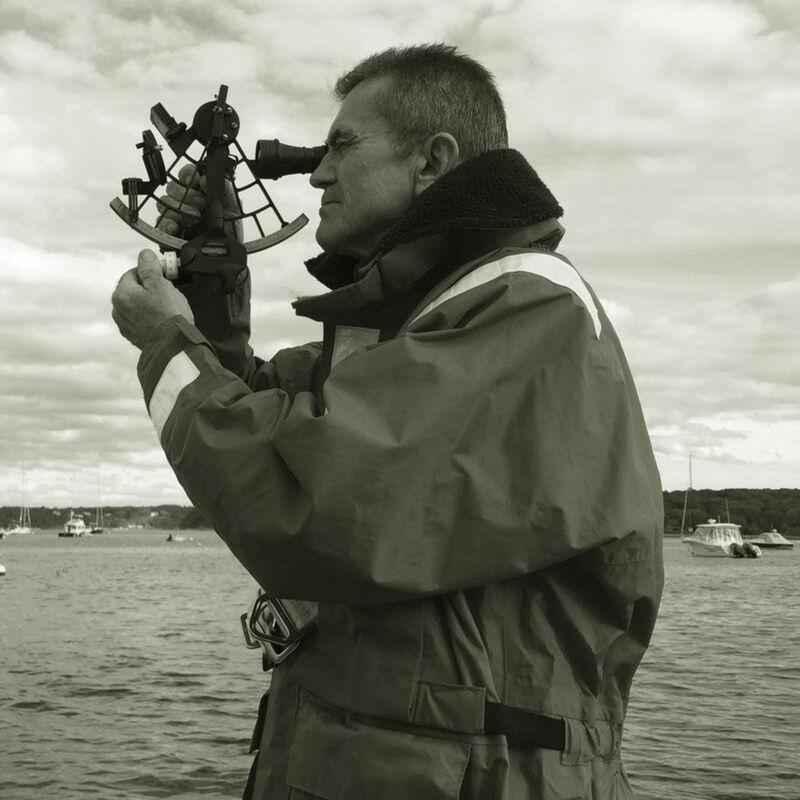 A lifetime of sailing and working in the marine industry has taught him a bit about preparation — thank you, Conrad Colman — and Kopar has needed every bit of that experience to get Puffin to the starting line. Puffin is a Tradewind 35 designed by John Rock of Poole, England, and launched in August 1986. Kopar bought Puffin in July 2015 to compete in the Golden Globe. 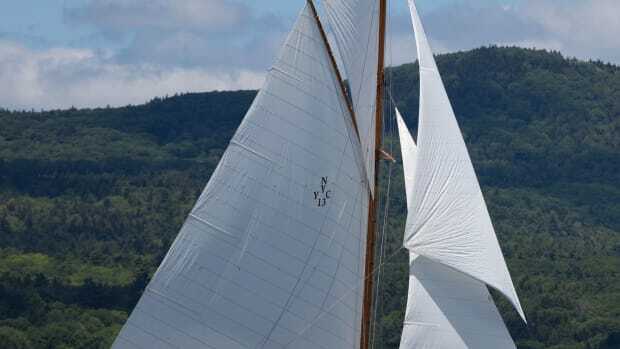 She was within easy striking distance of his base at Seawanhaka Corinthian Yacht Club’s boatyard in Center Island, New York, where Kopar had been sailing director and has the club’s support. Most important, the price was within his budget. Puffin had a hard life on the hard. She was stored at Willsboro Bay Marina in Willsboro, New York, for six years, and her condition reflected the long abandonment. “Birds, squirrels and bees had become regular tenants,” Kopar wrote in his blog. Few sights depress sailors as much as a derelict boat, and Puffin gave Kopar many reasons to feel down. Her chain plates were missing, and he had no idea how rough her plumbing, engine and other systems were. She was in no shape to be sea-trialed, so Kopar, in a leap of faith, offered the owner’s widow a lowball figure. She accepted. However, all that experience didn’t temper his surprise at what greeted him in the forepeak when he began working on the boat. 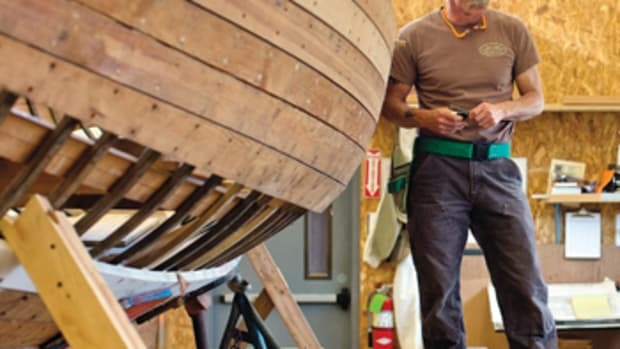 As he ground the laminate inside the bow near the stringers, preparing to reinforce the area with fiberglass to withstand the stress of the staysail’s forestay, he discovered light seeping through the hull. “There was essentially no fiberglass at all beneath the layer of paint,” he says. Puffin has required a lot of work, but Kopar is confident she is ready for the Golden Globe challenge. 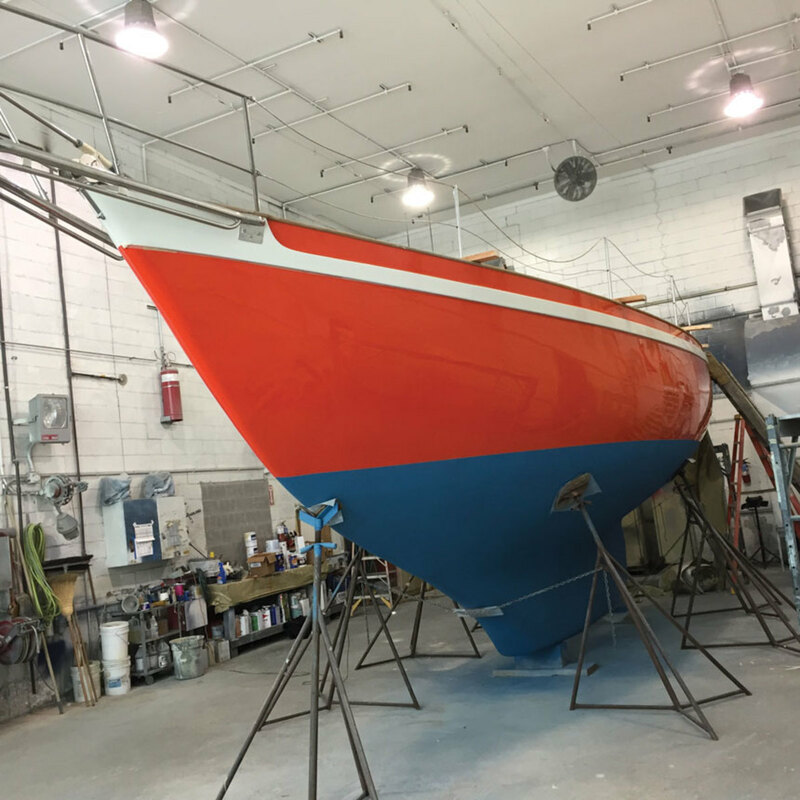 This prompted Kopar to remove the gelcoat from the topsides and add fiberglass to the entire hull. 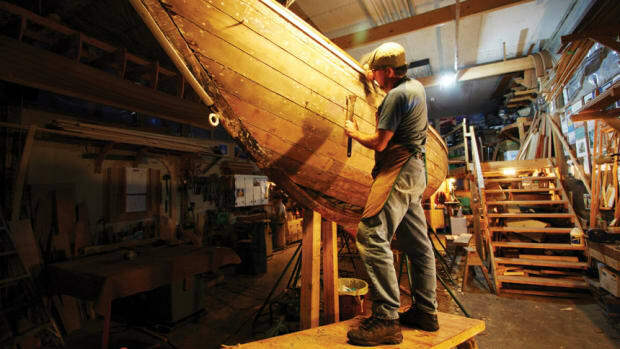 He applied several layers to the bow, keel and transom, along with two layers of biaxial fiberglass cloth with ¾-ounce mat backing and one layer of 7-½-ounce, plain-weave E-glass everywhere else. Although Puffin has gained weight, she should be strong enough to deal with nine months at sea. During summer’s quiet time at the yard, Kopar devoted 12 hours a day, seven days a week to painting. It should have been a fairly simple task, but the orange topcoat that Alexseal supplied wouldn’t cover the gray primer. Kopar wasn’t ready to abandon his international orange, so Alexseal sent yellow topcoat for the hull. After two coats of that, the painter sprayed three coats of orange. Problem solved. 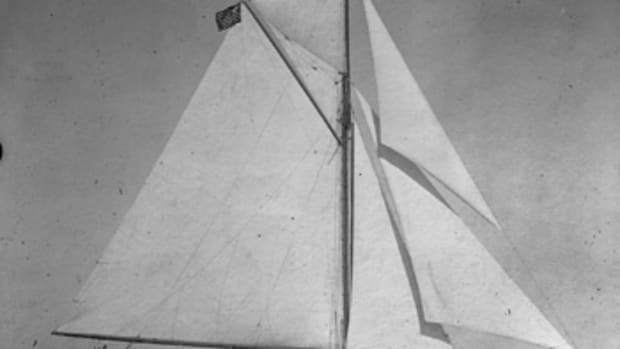 In addition to doing most of the labor, Kopar had to chase sponsors and establish a foundation so contributions to his effort could be tax deductible (koparsailing.com). A logical question is, why? “It’s the challenge,” he says. Kopar remains optimistic about making the start and believes that his experience renovating Puffin gives him an advantage. He’ll be able to cope with almost any problem that surfaces, and that should keep him from falling victim to uncertainties, fears and loneliness.